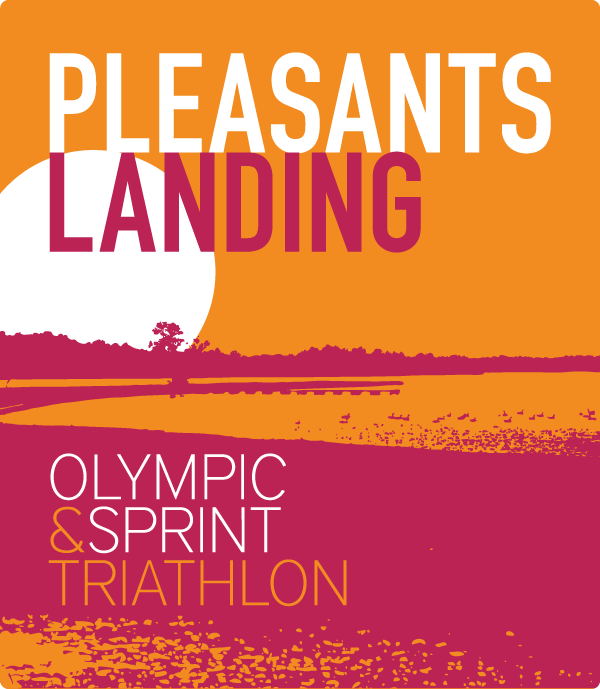 Hosted in the newly renovated Pleasants Landing Marina at Lake Anna, this race and venue are amazing. The swim lakes place in the southeast portion of Lake Anna, about 1/4 mile from where the “hot side” of Lake Anna empties into the cold side, resulting in water temperatures that are 4-6 degree’s warmer than the rest of the lake at this time of year. So, you can look forward to above average water temperatures in mid-October. The last open water race of the regular season Olympic starts at 9AM and the Sprint starts at 9:30AM, so you can sleep in a little and make it a day at the lake with family and friends. The race site and finish line are surrounded by water and have a view of the Blue Ridge Mountains to the West; it’s a great place to spend the weekend outside. Be sure to register early as this end of season race is extremely popular. Watch the video and register below. Swim Course: The 1.5K swim begins with an in water start on the south side of the transition area. Athletes will swim a triangular shaped course and exit the water on the north side of transition. The course will have 2 right turns and sighting buoys will be located approximately every 75 meters. We expect the water at this time of year and at this section of the lake to be 65-72F. A temperature reading will be taken and posted the Thursday prior to the event. The swim is as spectator friendly as it gets, family and friends can walk around the peninsula and “follow” their athlete through the swim course. Bike Course: The Olympic bike course is a 2 loop, 23 mile, rolling course on great pavement. Consisting of mostly right turns the course has an energizing mix of terrain and terrific views as you ride around, and across the lake. This is a beautiful course and a lot of fun to ride, plus Olympic athletes go right by the marina gate to start their 2nd loop. Please note that with the exception of emergency vehicles, no traffic will be allowed on the marina entrance road during the cycling portion of the event. All late arriving cars will be directed to the off site parking (1/4 mile away). Run Course: The Olympic run course is a 2 loop, out and back course. The run course leaves transition and goes through a short section of woods and gravel road to meet the main road. Athletes then run out and back on a closed course. The out and back section is paved and lightly rolling as you run by fields, forest and the South Anna River. Athletes starting their second loop turnaround on the gravel road just prior to entering the woods, athletes finishing their second lap proceed through the woods to then finish adjacent to the transition area. Swim Course: The 750 meter swim begins with an in water start on the south side of the transition area. Athletes will swim a rectangular shaped course and exit the water on the north side of transition. The course will have 2 right turns and sighting buoys will be located approximately every 50-75 meters. We expect the water at this time of year and at this section of the lake to be 65-72F. A temperature reading will be taken and posted the Thursday prior to the event. The swim is as spectator friendly as it gets, family and friends can walk around the peninsula and “follow” their athlete through the swim course. Bike Course: The bike course is a single loop 12 mile course. After a left turn out of the marina athletes have mostly right turns as they ride low traffic, well paved roads. The course is rolling with flat sections and a few short climbs coming off lake causeways. This is a beautiful course and a lot of fun to ride. Run Course: The sprint course is a pure out and back course. The run course leaves transition and goes through a short section of woods and gravel road to meet the main road (601). The out and back section is all paved and is lightly rolling as you run by fields, forest and the South Anna River. Athletes finishing their run by re-entering the woods and running a 1/4 mile back to the finish line adjacent to the transition area. You’ll love our swag! All athletes receive a Tri-Blend Long Sleeve Race Shirt, Custom Race Socks and a super cool, race themed Finisher’s Medal. Also, don’t forget the DJ, bounce house for the kids and a fabulous post race pizza. Race categories available for this race are Age Group, Aquabike, Relay Teams, Clydesdale, Master’s Clydesdale, Athena, Military, Collegiate, High School and Novice. All categories are scored 3 deep. All Kinetic Multisports races are USA Triathlon sanctioned events. Click HERE for a brief description of common USAT racing rules and how you can avoid getting a penalty in this event. All Kinetic Multisports race registrations are non-refundable. There are however options for race registration insurance and a one time deferral. Visit our FAQ’s for more details. All registered athletes will receive an email on the Wednesday or Thursday before the race with all the information pertaining to their entry to include bib numbers, wave start list with start times and any last minute details to make your race weekend go smoothly! race with automated links to find your images. You may also go directly to their website to review their custom products, and purchase your photos from this and other Events. Please Note: All participants must collect his/ her own event packet. Photo ID is required in order to collect event materials. NO ID = NO EVENT. HINT if you take a photo of your ID with your phone, that will be sufficient for photo ID purposes. Pre-Race Meeting: An extensive pre-race meeting will take place at 6 PM on Friday. If this is your first race, come to this meeting to have your questions answered. A second brief meeting will occur 15 minutes prior to the first wave on race morning. There are multiple lake houses for rent this time of year. Thank you for making this event your first triathlon! There are many more people like yourself who will be racing this type of event for the first time. Please note that if you register as a Novice, you will be scored in the Novice division, not your Age Group. By registering as a Novice you will start the race in the last wave of athletes if the race is an open water swim. USA Triathlon requires each triathlete to either have a current membership or purchase a 1-day license. The 1-day license can be purchased when you register. The cost of a 1-day license is $15, an annul membership is $50 for adults and $10 for kids under 18. Below are links to additional information that you will want to review before race weekend. Find a Club: Are you looking for a fun group of athletes to work out with? Find a club near you using the USAT Club Finder. Volunteers are the lifeblood of any successful event. If you would like to volunteer for this race just fill out the form below and we will put you to work! The Special Operations Warrior Foundation provides full scholarship grants and educational and family counseling to the surviving children of special operations personnel who die in operational or training missions and immediate financial assistance to severely wounded special operations personnel and their families. Please consider making a donation during the registration process. You can also make a donation via their website by clicking HERE. The Chesapeake Bay Foundation is a watershed protection agency that fights to keep the water we swim in clean. Please consider making a donation to the Chesapeake Bay Foundation during the registration process.